According to new research (July) undertaken in advance of Walk to School month (October) by Raisingkids, sponsored by Pom-Bear, 41% of children over 7 currently don’t walk to school. This figure is in line with Government statistics for primary school children being driven to school, who it is feared are becoming a generation of ‘backseat children’. The Department of Health recommends that children take an average of 13,000 steps per day, to guarantee enough exercise to avoid the threat of obesity and diseases such as diabetes and osteoporosis in later life. Currently, only six out of ten boys and four out of ten girls achieve the recommended one-hour of moderate physical activity every day. Children see things differently to grown ups – their peripheral vision is two-thirds that of an adult  and they have difficulty determining where noise is coming from. They also cannot judge the speed and distance of vehicles. Which, perhaps, explains why just 12% of 8-10 year olds traveled to school without an adult in 2006 compared to 80% of 7-8 year olds in 1971. 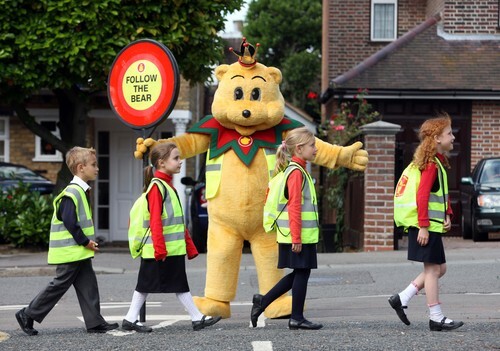 Pom-Bear recognises the many benefits for kids of walking to school and offers the following safety advice for parents supporting Walk to School month this October. Made for kids…Pom-Bear is a fun teddy-bear shaped potato snack that children love. Deliciously crisp and light they melt in the mouth to give a unique taste. WIN FOLLOW THE BEAR WALKING KITS! Visit www.pom-bear.co.uk for more information about the Follow the Bear campaign (and their products) and for a chance to enter a competition to win Pom-Bear Follow the Bear kits (worth £15), which contains a Follow the Bear high visibility jacket and sports bag, so your child will be seen at all times on their way to and from school, plus a multi-pack of Pom-Bear potato snacks for your kids to enjoy as part of a balanced diet. This press release was distributed by ResponseSource Press Release Wire on behalf of The Bottom Line Consultancy Ltd in the following categories: Children & Teenagers, Health, Women's Interest & Beauty, Food & Drink, Education & Human Resources, for more information visit https://pressreleasewire.responsesource.com/about.